Photo Identification – Is it really David Swayze? My thought is, don’t assume that a photo that is purported to be a particular individual is that individual without provenance or, at least, some kind of identifier information. David Swayze[i] was born on 10 June 1796 in Morris County, New Jersey[ii]; he died on 25 September 1850 in Kalamazoo, Michigan, aged 54[iii]. He was buried on 29 September 1850 in Kalamazoo at the Mountain Home Cemetery[iv]. He is the first son (second child) of Amos Swayze (1767-1839), aged 29, and Henrietta Chrisfield. It appears that he may have had an older sister, Cornelia. Her birth date is unknown. 1798 – Birth of his sister Elizabeth on 9 June 1798. 1800 – Birth of his sister Jane on 11 June 1800. 1803 – Birth of his sister Alice 9 September 1803. 1806 – Birth of his sister Polly 16 June 1806; Polly died 12 days later on 28 June 1806. 1807 – Death of his eight-year-old sister, Elizabeth in March 1807. 1807 – Birth of his sister Nancy 12 June 1807. 1809 – Celebration for young David, finally after six sisters a brother, Samuel C. was born on 28 August 1809. 1811 – Birth of another sister, Eleanor A., on 9 Dec 1811. 1814 – Birth of an eighth sister, Mary, on 22 Nov 1814. 1817 – Saw the birth of a second brother, Aaron Chrisfield, on 17 Jan 1817. 1819 – Two years later, David’s youngest sister Melinda was born on 9 November 1819. He had a total of nine sisters and two brothers. 1817 – He married[v] Katherine (sometimes Catherine) A D Walter (1794-1868), the daughter of James Walker (1752-1838) and Margaret Ann Swan (?-1804) on 30 January 1817 in Fairfield County, Ohio[vi]. David was 20 and Katherine was 22. The ceremony was performed by David’s uncle, Judge David Swayze. I have seen several researchers who have indicated that they moved to Virginia “first.” I have not found any documentative evidence indicating that move. David and Katherine lived in Fairfield County, Ohio before they married in Fairfield County and all their children were born in Ohio, and, I believe, Fairfield County. Different documents indicate they lived in New Salem[vii], others indicate they lived in Walnut, but always Fairfield County until the family moved north to Kalamazoo, Michigan about 1839 or 1840. David was one of the founders of Kalamazoo, Michigan. Although his life in Kalamazoo was short, only about 10 years, his impact was felt in many societies, organizations, and village life. David Swayzee died 25 September 1850 in Kalamazoo, Michigan. He is buried at Mountain Home Cemetery in Kalamazoo. · Elizabeth Jane Swayze, born about 1818 in Ohio, died on 25 March 1896 in Kalamazoo, Michigan, aged about 78. She married Isaac Wiseman on 25 March 1840, next she married Rufus Holton Darling on 27 August 1846. She had 6 children: Mary, Abner, Elizabeth, Emily, Eva and Rufus. · Emily Ann Swayze, born on 21 January 1820 in Ohio, died sometime before 24 January 1908 in Aurora, Kane County, Illinoi). She married Samuel N. Davis on 27 January 1846, next married Samuel McCarty on 15 April 1853. She had 8 children: Lucy, Eva, Sydney, Charles, Edgar, William, Sallie and Jenny. · Margeretta Swayze, born about 1821 in Ohio, died on 18 October 1823 in Lancaster, Fairfield County, Ohio, aged about 2. She had no known descendants. · Angeline Swayze, born about 1824 in Ohio, died at an unknown date. She had no known descendants. · William D. Swayze, born about 1826 in Ohio, died at an unknown date. He had no known descendants. · S. B. Swayze, born about 1828. She married, but has no known descendants. · Theodore P. Swayze, born about 1837 in Fairfield County, Ohio. He had no known descendants. · Caroline M. Swayze, born about 1838 in Ohio; she died at an unknown date. She had no known descendants. [v] Note: There is a conflict regarding the 1830 Census. Reinvestigate. Tracing 19th Century Women & Sally Ann (?) Darling. Tracing women in early 19th century history can often be a difficult process. Women often didn’t exist except in the context of their wifely status. Such is the case of Sally Ann (unknown) Darling. She is only mentioned in a couple documents that I have found, so far. I first encountered her name when I found the obituary of her son, Rufus Holton Darling, which mentioned that he is the son of Abner and Sally Darling. I also traced her husband, Abner Darling. That search yielded his will, which made Sally Ann the executrix. It mentions nothing other than her name. It doesn’t even mention the names of their children. In court, men attested to the validity of the will and it doesn’t appear that she ever addressed the court. The 1840 Census shows that Rufus H Darling is living at the same location (based on neighbors) that Abner Darling lived at before. Living with him was an older woman that I presume is Rufus’s mother – Abner’s wife – Sally Ann. Sadly, that is about the extent of what I have learned about Sally Ann. 1780 – Birth – The 1840 Census infers that she was 50-59 years old suggesting a birth year of 1780-1790. The 1830 Census infers that she was 40-49 years old also. I have been unable to find Sally in the 1850 Census. · I am further researching for Rufus Holton Darling’s siblings. Hopefully, results of that search will provide additional information or clues regarding Sally Ann. · Third cousins on the Darling DNA profile would share Abner and Sally Ann as common ancestors to my mother-in-law. Following clues there may help open this new brick wall. [ii] 1830 Census; New York, Monroe, Clarkson, Page 271 – Abner Darling; Ancestry.com. [iii] New York Wills and Probate Records, 1659-1999; Monroe – Wills, Vol 002, 1835-1841, Pages 329-331 (362-364 of 513); Abner Darling. Ancestry.com. Also, see the transcript. [iv] 1840 Census; New York, Monroe, Clarkson, Page 177 – Rufus H Darling. ; Ancestry.com. Author Don TaylorPosted on February 5, 2016 February 12, 2017 Categories DarlingTags Abner Darling, Darling/Huber, Rufus Holton Darling, Sally Ann Darling2 Comments on Tracing 19th Century Women & Sally Ann (?) Darling. Finding individuals before the 1850 Census is always problematic. I find the process to be an iterative process, that is to say, it is necessary to go through the same records several times until you find the right connections. Here is my process for finding Abner and Sally Darling. As is always the case, start with what you know (or think you know). According to the Kalamazoo Gazette, Rufus Holton Darling was the son of Abner & Sally Darling. He had come to Kalamazoo from Rome, Oneida Co., NY in 1840. [i] This article is about searching for Rufus in Oneida County and the search for his parents, Abner and Sally Darling. From this, I deduce that Israel Darling was born between 1800 and 1810 and probably worked on the nearby Erie Canal. Clearly no other Darling men were living in his household. From this Census record, I think it is fairly safe to conclude that Israel Darling was living with his wife and three children in 1840 in Rome. Rufus doesn’t appear in the Census for Rome, Oneida county, New York in the 1840 Census. So, there are three likely answers. 1. Rufus moved before the census date of 1 June 1840. 2. Rufus was somewhere else in Oneida County, near to Rome. 3. The newspaper article was wrong. A search of the 1830 Census yields seven Darling’s listed. Again, no Abner. I wouldn’t expect the then 14-year-old Rufus to be enumerated, but rather be in another household. The only other chance is to find the family in Oneida County the 1820 Census. A search on Ancestry.Com yielded 8 entries for Darlings in Oneida County, New York. None were in Rome; however, there were two entries for Abner Darlings. infers there was an Abner Darling who was born before 1875 living in Oneida Co., so I should make a “do not confuse with” entry in my worksheets. This likely shows a simple farm family with two adults and seven children under 16. The good news is that Rufus could be one of these three males under 10. The bad news is that it is not Rome. Paris is a small town about 17 miles southeast of Rome. However, Paris is only about ten miles south of Utica, so I would expect that people from Paris would associate themselves with Utica and not Rome. Abner Darling of Paris doesn’t show in the 1830 census gives rise to my speculation that Abner Darling of Paris either died or moved sometime between 1820 and 1830. I think I’ll use that as a hypothesis and continue on. Returning to the 1830 Census, sadly none of the entries for Darlings in Oneida County are in Paris. So, it appears that Abner either died without his heirs continuing on the property or that Abner moved. The Abner of Paris in the 1820 Census closest census (three on each side) neighbors were: Henry F West, James Eastman, David Pixby (? ), John Ramsdale, Solomon Stockwell, and Joseph Ballou. I decided to see if they show in the 1930 Census. Henry F West Appears to have moved to Richland, Oswego County by 1830. James Eastman – No John, but there an Amasa Eastman in Kirkland and two Benjamin Eastmans in Paris. John Ramsdale – No John, but there is a Henry Ramsdale in Kirkland. Solomon Stockwell – shows in the 1830 Census living in Kirkland. No there are Darlings enumerated on the same page (11). Joseph Ballow – Also shows in the 1830 Census living in Kirkland and also on Page 11. The good news is that Kirkland was established as a town in 1827 from the town of Paris. People in Kirkland in 1830 would have been in Paris in 1820 without having moved. Because of this, I have little doubt that I found the neighbors of 1820 Abner of Paris and looking at those neighbors, neither Abner nor any other Darlings are in Kirkland in 1830. 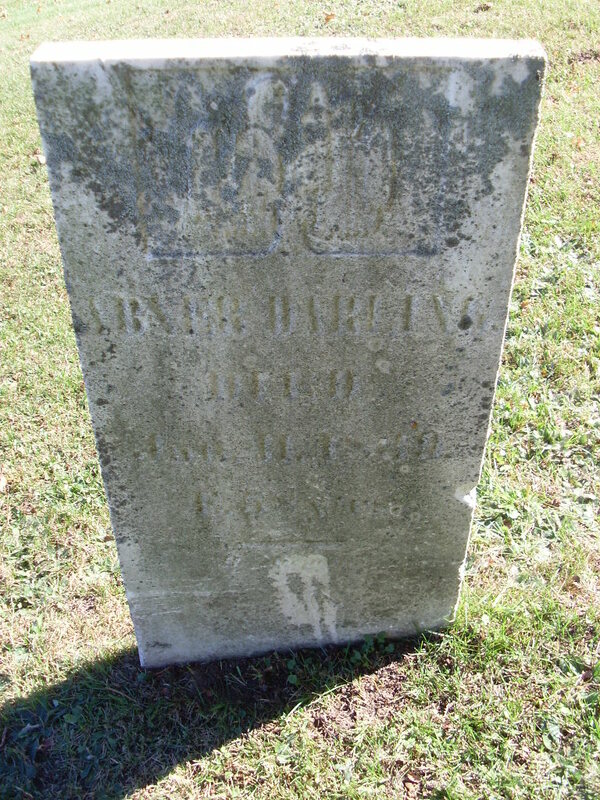 Abner Darling Born 1776-1794 – Married before 1807. (Engaged in Agriculture. Sally [Darling] Born 1776-1794 – Married before 1807 – Died after 1820. For a marriage date, I am assuming that the 1820 Abner Darling of Paris census entry was a standard family unit, that is to say, husband, wife, and 7 children. I presume that they were married before the oldest child was conceived. They have three children over 10 in August 1820 so the oldest of the three children must have been born by 1808 and conceived by 1807 (presuming no multiple births). At this point, I was kind of stuck. Then I looked at the wills and probate records on Ancestry.Com. It is a fantastic resource. I quickly found the Will of Abner Darling who died in 1839 who gave everything to his wife Sally. Could this be the same Abner and Sally Darling who were the parents of Rufus Holton Darling? I thought I’d take a look at the 1840 Census. Sally would, most likely, still be in Clarkson only a year later. A search yielded a huge find. Rufus H Darling was the head of a household in Clarkson. I have little doubt that this Rufus H Darling entry is the correct Rufus H Darling and that his father, Abner Darling of Clarkson, died in 1839 and that, in 1840, Sally Ann Darling was living with her son Rufus H in Clarkson, Monroe Co., New York. Then I went back to the 1830 Census and found an Abner Durling living in Clarkson, Monroe County, New York. One of them is probably Rufus. Other Unk Male in 1840 Census. Everything appears to fit my expectations for the Abner Darling family as I would expect it to be in 1830. The will of Abner Darling provided the break that allowed me to think outside of the Rome, Oneida County box. I now believe that Rufus Holton Darling was born near Rome, New York. When he was a child from 5 to 15 years old, the family moved to Clarkson, New York (about 20 miles west of Rochester). In 1839, his father passed and the 25-year-old Rufus became the head of the household. In late 1840, Rufus located to Kalamazoo, Michigan. Solving family history by using the pre-1850 censuses can be difficult and complex. There are seldom easy answers, but through perseverance, a viable conclusion can be reached. Now to sort out Abner in the 1810 Census. 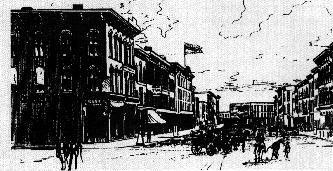 There are five Darling families in Oneida County during the 1810 Census. One of them is “A. Darling.” The eldest in that enumerated family is over 45 years old. Too old to be our Abner. But there is a 16 to 25-year-old male in that enumeration who could be our Abner. Another fine investigation to undertake…. Born 1780 – The 1830 Census indicates he is between 40 and 49 years of age, suggesting a birth between 1780 and 1790. His marker on Find-a-Grave appears to indicate his birth in 1780. 1839 – May 1, Abner’s will was probated. His wife, Sally Ann was the Executrix. Determine the siblings of Rufus H Darling. Find Abner Darling in the 1790, 1800, and 1810 Censuses. Determine Sally Ann Darlings maiden name. Determine what happened to Sally Ann Darling. [i] ”KPL 3X5″ Vital Record Files, Kalamazoo Public Library;, Kalamazoogenealogy.org. [v] “1840 Census,” Clarkson, Monroe, New York, Roll: 297; Page: 177; Image: 359, Rufus H Darling, Ancestry.com, 12 Jan 2016. [vi] “1830 Census,” Clarkson, Monroe, New York, Series: M19; Roll: 94; Page: 271, Abner Durling (Darling), Ancestry, 12 Jan 2016. [vii] “1820 Census,” Paris, Oneida, New York-, Page: 267; NARA Roll: M33_73; Image: 270, Abner Darling, Ancestry.Com, 12 Jan 2016. [viii] See Endnote VI Above. [ix] “New York Wills and Probate Records, 1659-1999,” Monroe County, New York, Abner Darling, Wills, Vol 2, 1835-1841, See Pages 329-331, Ancestry.Com. [xi] Find-a-Grave, Abner Darling, “Memorial #131155053,” http://www.findagrave.com/cgi-bin/fg.cgi?page=gr&GRid=131155053, 9 Jan 2016. Great-great grandfather Rufus Holton Darling’s father’s name was Abner and his mother’s name was Sally. Although I am not totally convinced, I am fairly certain that this “Record of Will” refers to Rufus’s father Abner. It also helps explain why Rufus would have left New York for Michigan in 1840. At Abner’s death, Rufus would have been 24 years old. 8 January 1839 – Abner Darling of Clarkson, Monroe County, New York was alive to sign his last will and testament. He made his wife, Sally Ann Darling the Executrix of his will. He gave everything to his wife, Sally Ann Darling. He wants his debts paid. He has pending litigation against Nathan Mott & Ansel Frost. His wife should take care of his minor children including educating them. Jan-April 1839 – Abner Darling died. 1 May 1839 – Abner’s will was probated. First I make & Constitute my beloved wife Sally Ann Darling sole executrix of this my will. Second. I give & bequeath to my said wife all my goods and chattels land & tenements & all my estate both nal [real] & personal of which I may die seized or possesed or whether in fasision or in action to have & to hold the same to her own use – forever, Third, It is my will that all my just debts be paid & in as much as the ability of my said executrix to pay the same will depend on the determination of a suit now defending in the Court of Chancery against Nathan Mott & Ansel Frost it is my will & desire that said suit be prosecuted with all diligence to a determination & that my said executrix shall perform whatever shall be nessary & proper to perform whatever deorse may be made therein trusting in consequents of the Justice of the cause that she will thereby nalise the means of paying my debts, And it is my request & desire that my said executrix will in her discretion & according to her means maintain and educate such of my children as are minors they aiding and assisting therein & that at or before her decease she will if need be make such bequest or other arrangement that what may remain of my property after her decrease may be equally divided among all my children. In witness whereof I have hereunto set my hand & seal this eighth day of January 1839. Signed sealed published and delivered by the said Abner Darling to be his last will & testament in the presence of us & who in his presence have subscribed our names as witnesses all residing in Clarkson. 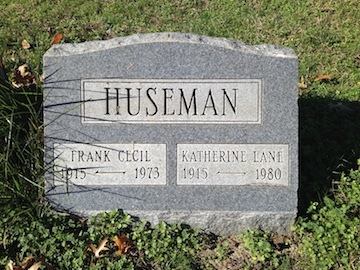 Frank Husman married Katherine Lane (date unknown). Frank died on 18 March 1973. According to Find-a-Grave, he is buried in Site 6, Lot 370, Section K, at Glenwood Cemetery, Washington, District Of Columbia, USA. He died at the age of 57.